Just try not to bite your nails. Is there any other culinary pleasure in this life so simple, yet deliciously complex, as pizza? I think not—just consider the endless combinations of meats, veggies, cheeses, herbs, and spices all hanging out on a tasty crust, and you’ll agree with me on this one. Given this amazing variety, you don’t have to make every single pizza-centric nail exactly the same in the following PIZZA MANICURE DIY. I mixed things up and made some meat, some veg, and a few combo slices. I know you’re probably like, “Marie, what took you so long to show us how to do some pizza nail art?! HOW DARE U.” I’m sorry, my pals…I was too busy eating all the pizzas! Nail polish in any color(s) except yellow, orange, or brown for your base. I used Floss Gloss’s Wavepool and Deborah Lippmann’s Break 4 Love. A yellow polish like Milani’s Yellow Whiz. A red polish—mine is Gangsta Boo by Floss Gloss. A green polish—mine’s Mojito Madness by Essie. A black or dark brown polish such as Floss Gloss’s Blood, Suede, and Tears. Tape. I used regular masking tape like this. A dotting pen like this one or bobby pins. Paint your nails with your base color(s). I alternated pastel blue and pink, but you can pick almost any shade you like—just don’t use a yellow or orange base, since that will camouflage your pizza! Cut three small pieces of tape and apply them to your nail so the exposed polish is shaped like a triangle. It’s best to use something less sticky than Scotch tape—I recommend masking or washi tape. Repeat on the whole first hand you’re painting. Paint the exposed area with yellow polish. Don’t my hands look like Doritos here? 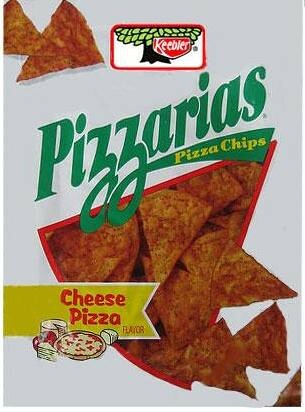 Wait, does anyone remember pizza chips? Can we start a petition to bring these back immediately?? Gently peel off the tape to reveal your pizza crust. Now comes the best part of any pizza-making process: adding the toppings! If you’re into pepperoni, dip your dotting tool or bobby pin into the red polish, and gently draw small circles onto your nails. Wipe off your tool (with polish remover if necessary), dip it in green polish, and lightly drag it across the crust to make rectangles, aka bell peppers. Lightly paint a brown line at the edge of the pizza to create your crust ends, or as my BFF likes to call them, “pizza bones.” Let your polish dry completely, then apply your top coat. I’ve been waiting my whole life for this! Thanks Rookie!! YESS!!!! I’m so excited to do that. This is the most perfect nailart DIY I have ever seen in my life. I am so going to do this haha. Pizza is my favourite food ever I don’t know why I havn’t gotten this idea before.